Octavia Art Gallery is pleased to present Scott Andresen & Martin Benson: Toward Wholeness.This exhibition features two New Orleans based emerging artists whose works are garnering significant attention on the contemporary art landscape. For Scott Andresen and Martin Benson, the process that guides the development of their work is created through repeating elements in methodical arrangements. The building of each fragment in order to create a unified piece is integral whether it is a swatch of color, a piece of sandpaper, or as a single journey toward wholeness. Andresen and Benson share deep similarities in approach and intention, yet their expression yields quite different appearances on the material level, exemplifying a fundamental component of the human condition. 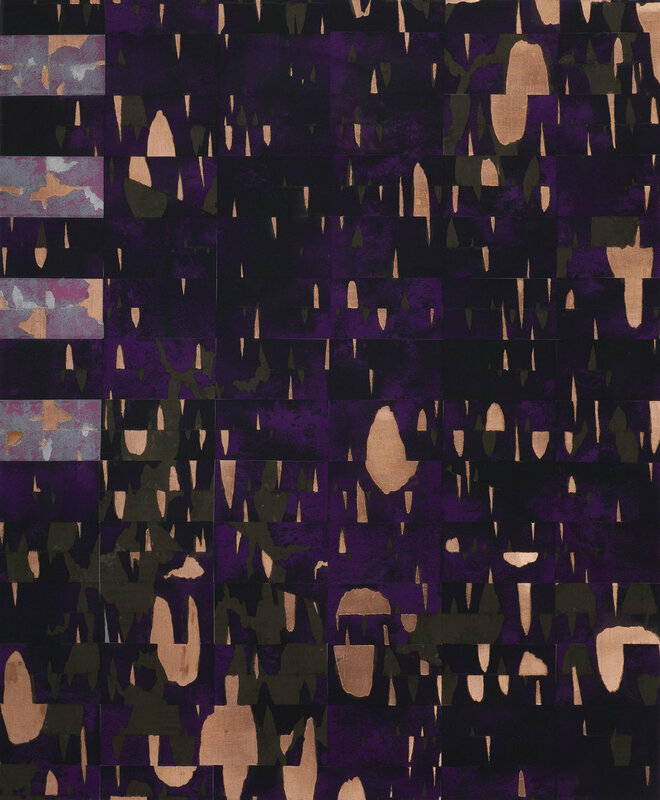 Scott Andresen’s collage and mixed media works explore themes of repair. In the summer of 2010, a major life event occurred when he was bicycling and was struck by a car, suffering a host of traumas that threatened his health and mobility. During rehabilitation process, he began studying the history of repair, focusing on the various ways domestic objects have been mended over the years, and using it as a source of inspiration. His current work is inspired by a Japanese form of ceramic repair in which the cracks of broken objects are dusted with gold and silver to highlight, rather than conceal the break. While renovating his house in the Lower Ninth Ward, Andresen started collecting spent pieces of sandpaper, each a small abstract composition of marks and tears. He began repairing each piece by mounting and patching the torn areas with gold or silver leaf. Sandpaper is a normally inconsequential material with a short life span, in Andresen’s hands each short life wears the marks of its own history, and collectively the repaired objects become something much greater as a whole. Martin Benson is a painter, sculptor, and installation artist. His work emerges from his meditation practice, which peels back the layers of identity until a place of pure clarity and awareness is uncovered. This return to the experience of wholeness is a process which unfolds gradually, step by step. His paintings and light sculptures convey this message through the tiny individual color swatches or light that builds to create the work as a whole. He constructs his own shaped canvases comprised of meticulously painted color swatches in varying sequences. Benson ultimately intents to provide an art form that invites the viewer to look and experience without the need for immediate interpretation or intellectualization. Scott Andresen received his MFA from Yale University and his BFA from Hunter College. He has exhibited in over 50 group and solo exhibitions including the Jack Tilton Gallery, Lehmann Maupin Gallery, Exit Art, Naples Museum of Art and The Bronx Museum. He has attended residencies at Socrates Sculpture Park and Lower Manhattan Cultural Council, while also receiving grants from New York Foundation for the Arts, the Pollock Krasner Foundation, and the Jacob Javits Fellowship. He has works in the permanent collections of the New Orleans Museum of Art and the Museum of Arts and Design (NY). Andresen is an Assistant Professor at the LSU School of Art where he oversees the Foundations program. Martin Benson received his MFA from the University of New Orleans and his BA at the University of Southern California. He has exhibited at the Ogden Museum of Southern Art, the Contemporary Arts Center (LA), the New Orleans Museum of Art, and the Jazz and Heritage Foundation. He recently created a permanent light installation at the Aloft Hotel in downtown New Orleans, and was been commissioned by the New Orleans Arts Council to create a site-specific installation for the LUNA Fete Art festival in 2016. His work is in private and public collections, including the University Hospital (LA). Benson teaches at Isidore Newman School and instructs yoga and meditation classes at Wild Lotus Yoga, both in New Orleans.